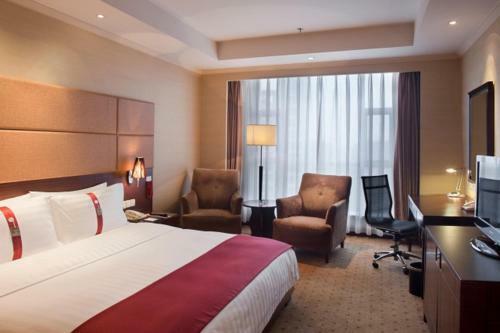 Holiday Inn Chongqing North is close to Hongtudi Subway Station (line 6) with direct access to Chongqing International Expo Centre. It is a 5-minute drive from Chongqing Railway Station and a 10-minute drive from Jiefangbei. Jiangbei International Airport is about 20 minutes' drive away. All rooms are equipped with a work desk, in-room safe and coffee/tea maker. Concierge and 24-hour room services are both available. Holiday Inn North Chongqing has an indoor pool and a recreation & sports centre. Guests can work in the business centre. Liu Xiang Chinese Restaurant offers Cantonese and Sichuan cuisine. International buffet and a la carte menu can be found at Salt & Pepper. Drinks are served at Onion Bar and the Lobby Lounge. This twin/double room features a seating area, minibar and air conditioning. This apartment features a bathrobe, air conditioning and satellite TV. Room type is entitled to Club Benefits, which includes free cocktail hour and complimentary snacks. Room offers free afternoon tea and free laundry for 1 shirt during your stay. Features with separate living, kitchen and complimentary breakfast is in the executive lounge. Check-in desk is on the 25th executive floor. Room offers welcome fruit, free usage of executive meeting room for a hour. This studio features air conditioning, bathrobe and minibar. This apartment has a electric kettle, bathrobe and cable TV. Room type is entitled to Club Benefits, which includes free cocktail hour and complimentary snacks.